The Canine Good Citizen program is used by some Therapy Dog organizations as a primary step towards becoming certified as a Therapy Dog Team. The Process: The first step is to contact a Therapy Dog organization in your area. These organizations are responsible for your certification and adoption into their program. Once accepted, you will be trained and covered by their insurance as well as used through their organization to volunteer at events or facilities within their domain. Love on Leash: Chapters in Los Angeles, Ventura, and Orange Counties. Love on 4 Paws, Animal Assisted Therapy: L.A. County serving Culver City, Downey, Gardena, Granada Hills, Los Angeles, Lomita, North Hollywood, Pasadena, San Pedro, Torrance, West Hills. As a dog trainer, I am eager to learn how to more effectively motivate, connect, and understand the animals that bring us so much joy, our canine companions. 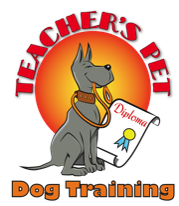 Because of this, I encourage you to browse the sites of some of the leaders in the dog training field. Below, you will find links to those I have benefitted from and hope you also will learn from their expertise. Dr. Sophia Yin, DMV MS was an incredible resource for all who want to establish a positive relationship with their canine companion. I've included her web link as well as some informative illustrated posters she has provided. I encourage you to browse her website and learn how our dogs try to communicate with us and how we can respond to ensure a respectful two-way communcation. Grisha Stewart is the creator of Behavior Adjustment Training, a training strategy focused on dogs coping with fear and aggression. Her methods help us teach our dogs non-aggressive coping strategies in dealing with stress through positive based training. This is where I go to get most my supplies. 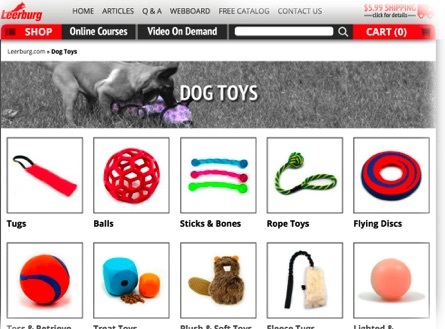 Doggie Toy Store: Leerburg, an on-line store, carries high quality toys that stand the test of time and breed. Fleece Tugs: Tugs are wonderful in teaching our puppies what is items are appropriate to play with, a great reward for good behavior, and the first step in teaching our dog tug. Machine washable. 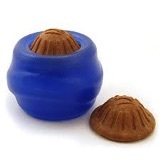 Everlasting Treat Ball: An incredibly durable chew toy that keeps your dog occupied for some time. This toy will stand up to the most aggressive chewers. 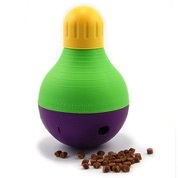 Comes with a treat plug with the option of stuffing with treats that are released as the dog works the toy. Great toy to place in the kennel to keep them occupied. Can find on-line or many retail pet stores. Freedom No-Pull Harness: I've tried other no-pull devices and nothing compares to the Freedom No-Pull Harness. The design and quality is un-matched and they stand behind their product. You discover an immediate improvement when you place your dog in this harness, with no fuss! Happy Howies Dog Treat Roll: My exclusive roll when using treats as a reward. High quality and it does not crumble when you cut into small pieces. Comes in Turkey, Lamb, and Beef. Can find on-line or in local pet supply stores. There are just some products that I must have when I'm training. I am not receiving any commission from the sales of these products. I just thing they are fantastic. Bob-a-lot: Treat dispensing toy by Starmark. An interactive toy that keeps the interest of your dog for quite some time. Available on-line or at major pet retail stores. Leashes: Leerburg.com has the largest selection of high quality leashes I have found and I use their leashes exclusively in my trainings. Any toy or product must be supervised. Never leave a dog alone with any toy.